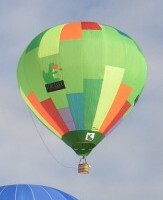 Here you can see all our model balloons which we built since 1993. 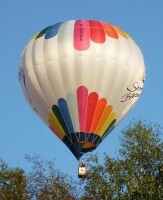 Since then we are flying them regularly at (model) balloon meetings, mostly in Germany, but in the rest of Europe as well. The Schlegel workshop has produced three baskets (12.6 in, 20.5 in and 28 in tall) and six envelopes so far, Bastian Schwarz and his D-OABS are in the team since 2006. 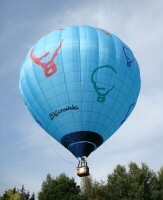 Our first model balloon was built of scraps of material from the big 'Volksbank Pforzheim' hot air balloon. We worked out everything by ourselves, from the pattern for the envelope right down to the gas installation, with which we received great help from Jan Gloß from the Ballongruppe Kieselbronn. Flight duration: approx. 1 h.
Time for construction: approx. 170 hrs. 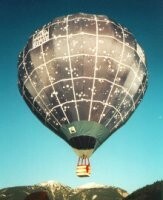 Our second model balloon is the clone of an original SCHROEDER fire balloon. 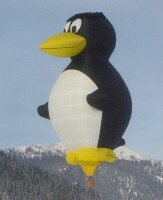 Cartoonist Uli Stein and his publisher Gerd Koch had had the big "Pingi" made in 1993, after a popular cartoon figure of the drawer. Three years later, we built the baby of the balloon. One single newspaper photo served us to design and put together the entire bird. Flight duration: approx. 40 min. Time for construction: approx. 250 hrs. Our third model balloon was a study how small a rc balloon could be. For competitions a certain flight duration had to be guaranteed. This is one of the smallest free flying remote controlled balloons of the world. Flight duration: approx. 25 min. Time for construction: approx. 80 hrs. Our fourth model balloon envelope was a co-production with the "Kepler - Gymnasium" in Pforzheim, the school which I attended at that time. Pupils of the ninth form, directed by their teacher, painted the gores with stars, a coordinate system and the logo of the school. Time for construction: approx. 60 hrs. Our fifth envelope we bought from Bernhard Wedi from Emsdetten who, unfortunately, had to give up this hobby for health reasons. 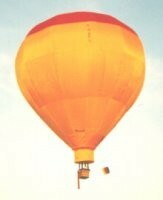 And as he wanted his wonderful balloon to be in good hands, he sold this jewel to us. Time for construction: approx. 400 hrs. Our sixth model balloon envelope turned out to be a replica of a SCHROEDER balloon again - also the Cat exists as a big mancarrying balloon. 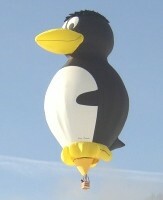 The "Maunzerle", as we call it, was even more complicated to build that the Penguin. Corrections at the ears and mouth sometimes nearly drove us nuts, and all the hair had to be painted up by hand with a brush. Time for construction: approx. 350 hrs. 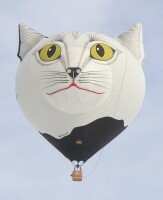 The seventh balloon in our fleet is a true co-production. Shape and design of the envelope were made by Matthias, who - together with some other well-known model balloonists - didn't stop to act upon Bastian Schwarz until he saw himself forced to start building his first own model balloon. Sewing the envelope he received great help from his mother Angelika, that's why the balloon was finally named D-OABS. Flight duration: approx. 1,5 h.
Our eighth model balloon is an experimental project - the probably first radio controlled solar balloon of the world. The "Black Pearl" gains its lift solely from solar power, which means that it can only fly in adequate weather. 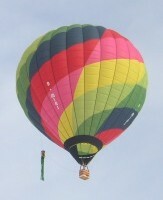 The balloon is controlled by a valve at the top, with which warm air can be released. Also, the basket contains a storage of sand, which can be emptied by remote control. Time for construction: approx. 100 hrs. 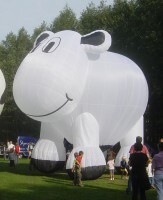 At Buch am Erlbach in Bastian's workshop, our ninth model balloon was created - the first balloon sheep of the world, realised out of Bastian's own idea. Designing the shape, we received great help from Martin Kaiser from Haßfurt, sewing Basti did completely by himself this time (without his mum). Twelve years after our first Penguin, it was time for a second one - hundreds of flights in all kinds of weather had weakened the 1995 made envelope. Over the time of one year, Matthias enlarged all measures of the first Penguin by 16.3 percent, brought them on templates, designed convex eyes and protruding wings, cut out the over 400 parts and sewed them together. Time for construction: approx. 200 hrs. 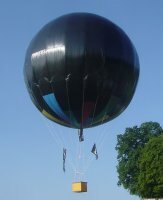 In early June 2008, Matthias and Basti developed the idea for another model balloon envelope: For the 15th anniversary of the Balloon Meeting at Bad Griesbach, they wanted to build a balloon dedicated to the event. Matthias designed the artwork within three hours, giving Bastian 300 hours of work: Making templates, cutting, sewing artwork and finally putting it all together... and eventually, one day before the 15th Bad Griesbach balloon meeting, everything was complete! Time for construction: approx. 300 hrs. 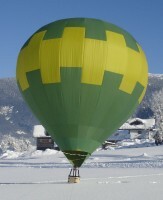 In summer 2010, Matthias fulfilled a dream of a lifetime: One and a half years after receiving his pilot's license for hot air balloons, he bought his first mancarrying balloon. Basket, burner and trailer derive from a balloon placed south of Munich, the envelope was formerly flying for a balloon company east of Münster. With only 150 hours of flying, it is almost as good as new and we will surely have long time fun with its colourful design. Max. flight duration: approx. 2 hrs.